Details The twenty-eight year old Marlene Dietrich is pictured here as Lola the sensual cabaret singer in top hat, high heels and black stockings. The song from the film "Falling in Love Again" and this image of Marlene Dietrich remain one of the great moments of cinematic history. 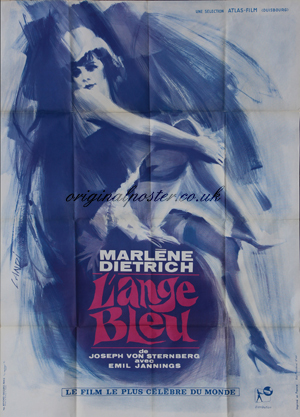 Large folded French 1966 re-release film poster with a stunning painting of Marlene Dietrich by Landi. This folded film poster is in excellent condition.